He felt shivers passing through him, tears filled his eyes. He felt as if his muscles were melting, and his body was on fire. Mind was wheeling and he was unable even to stand erect. He felt unable to hold aloft his mighty bow and many such undesirable signs. Arjuna further said “Even if the Kauravas are wrong, and mistaken in behaving that way, yet after killing all these people, what happiness shall I get? By destroying Grandfather Bhishma, Guru Dronacharya, and other relatives what do I gain? Even if I get the empire of all the three worlds, I do not want it. ‘Tell me, O Deva; has anybody, ever secured happiness by destroying one’s own kinsmen?’ Arjuna, went on arguing in this manner. But if we consider carefully his arguments, we can see clearly that Arjuna is under the shadow of his attachment for his kinsmen. Thus on the battlefield of this terrible war, Arjuna has become the victim of attachment for his kinsmen! Delusion is the result of this attachment and his sense of duty has weakened. Saint Gnyaneshwar cites the example, of how a bumblebee, which is capable of boring through a piece of wood, gets caught in the petals of a lotus as the night falls! Same happened here! Arjuna, the warrior fell a victim to the attachment for his kinsmen. 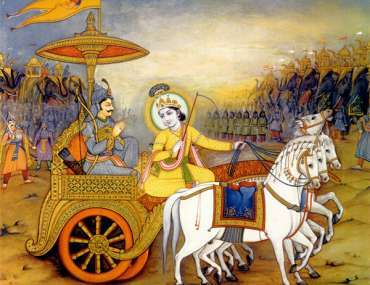 Arjuna, a great hero, who had come to the battlefield to teach a lesson to evil Kauravas, fell under the spell of attachment for his relatives. Therefore, he started to give reasons arguing against what his duty, required of him. Thus he started to convince Shri Krishna himself. 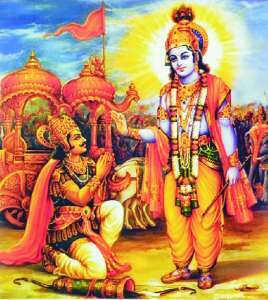 “O Lord Krishna, what a calamity will befall us as a result of this fierce war. The whole families on both sides will be destroyed. Adharma will reign. Licentious behavior will be rampant, affecting Kula-dharma adversely. There will be frequent famines. There will frequent natural calamities like famines, epidemics following each other. Therefore, O, Lord, such a war should be avoided at all cost. ‘Oh, we are about to commit a great sin! But really speaking, here Arjun totally forgets, that these Kauravas had committed many atrocities, many injustices, towards the Pandavas. How they behaved an unjust and wicked manner? How selfish and cruel, they had been, not only towards them but also towards Draupadi and thereby insulted the womanhood in general? These Kaurava clan, by their irreligious and inhuman behavior were a blot on the whole world. To check and discipline them had become urgent and important. 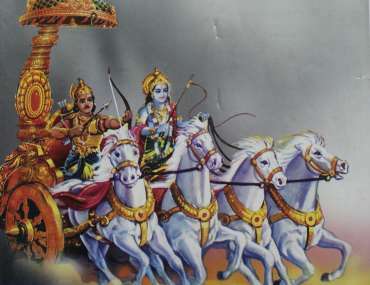 But all this Arjuna forgot and did not recognize his Dharma, highest duty! The only reason was attachment for so called swajan, own people. Therefore upon hearing all these borrowed arguments/statements of Arjuna, seemingly correct but which were wrong and rooted in Asakti-Attachment, Bhagawan Shri Krishna said, “Arjuna, why are you saying all this, apparently intelligent, but misleading talk? You are mourning about matters which need not be mourned; and again as if, these were the last words of wisdom! Remember, ‘Atma-gnyani’, the truly ‘learned’, who have achieved ‘Atma Gnyan’ i.e. the knowledge of the “self”, know that death is to come, and never mourn on that count. They recognize the clear difference between Deha-buddhi, bodily sense and Atmabuddhi, the concept of the Soul. They also know that the soul is immortal and perpetual and the body is bound to be disposed of one day. They recognize the immortality of the Atma, and the temporary existence of the body. They also aware of the importance these principles. You are unaware of Brahma Vidya and its usefulness. And again you are exhibiting your hollow claim to knowledge? What can I say to you? Those who have passed on any those who have not.